Are there non-floating underwater neck straps for underwater digital cameras? About 6 years ago I bought the Canon AKT-DC1 kit for my Canon D10. The underwater straps were fantastic. 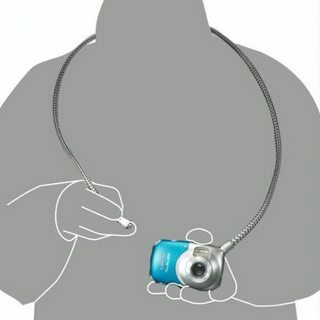 It had shoulder and neck straps that allowed you to swim rigorously with the camera in a way that wrist straps don't allow you to do without banging the camera around. I've ordered the Olympus TG-3 since my Canon D10 is getting a bit old and I'm not sure how much longer the seals will last. But I can't find a neck strap for the TG-3. Are there not any good generic neck straps for underwater cameras? I'm an avid snorkeler so floating straps aren't interesting to me since I tend to dive quite a bit for good photos. Aside from the snap and lock feature, which you note most cameras do not have, there does appears to be nothing particularly special about the Canon AKT-DC1 neck strap. Especially if you want it to not float, straps made of any material should do. As @Mikkel notes, you can "make" your own with bungee cord and bolt-snaps. Bungee cords come in various lengths with different types of hooks and buckles attached. Other options include neoprene, nylon webbing, and quick-release buckles.